This recipe for Poussin with Spiced Berry Sauce comes from bottlegreen the Cotswolds based soft drinks and sorbets producers. Tucked away in the heart of the Cotswolds, the bottlegreen factory is home to a team of expert winemakers that use their acute understanding of the adult palate to craft beautiful soft drinks and sorbets. Kit and Shireen Morris established the company in 1989 with the dream of making English wine from the locally abundant elderflowers. However, the couple adapted their plans and instead used their winemaking expertise to produce non-alcoholic drinks using traditional production techniques and the finest ingredients. In the beginning Shireen would glue each labels onto the bottles by hand. They would then be taken to the local farmers market in South Woodchester and Nailsworth to be sold to the people of Stroud and rural Gloucestershire. Word soon spread of the exceptional taste and quality of the bottlegreen Elderflower cordial, for which they are still famous for. As the bottlegreen reputation grew so did the bottlegreen team! 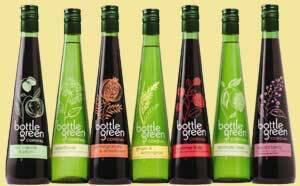 Now the companys range of award winning cordials, sparkling pressés and sorbets are enjoyed across the UK and in many countries around the world. The drinks are much loved for their unique blend of intense flavours and are equally praised for the stunning glass bottles that make them so distinctive. This recipe would be excellent with partridge. You can also use other berries such as blackcurrants or raspberries. Heat the oven to 200°C / 180°C fan / Gas mark 6. Rinse the poussin, and dry on kitchen paper. Season inside the cavity of each poussin and then place a portion of orange and three sprigs of thyme onto each. Place poussin in a roasting tin, brush the birds with oil, and then pour in the hot chicken stock. Cover with foil and bake in the oven for 50 minutes. Remove the foil and roast for an additional 15 - 20 minutes until the poussin are golden. Meanwhile, start to make the sauce. Heat the butter in a medium pan, add the shallots and cook gently until softened. Pour in the wine, bring to boil and continue to boil until reduced to about 4 tablespoons. Take the pan off the heat. Lift the poussin from the roasting tin and keep warm in the oven. Pour the juices into a separating jug. Once settled, pour the juices through a sieve into the saucepan, leaving behind the fat. Bring the sauce back to the boil and simmer 3 - 4 minutes to reduce by about one-third. Stir in the Spiced Berry Cordial and the blackberries. Blend in the corn flour with a tablespoon of water, stir into the sauce, and simmer for 2-3 minutes. Season if needed. 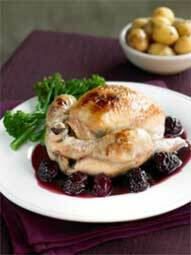 Place a poussin on each serving plate and spoon the berry sauce around. Ready to serve.